Last night my friend and I got together to celebrate Imbolc. We were planning to perform a ritual, and after we centered ourselves, I cast a circle. It had been some time since I had cast a circle, and I realized soon after I began how much I had missed creating sacred space. Casting a circle is creating a sacred protective space to perform ritual, meditate, craft, perform a magickal work or just commune with Spirit. For awhile I had questioned when it was necessary to cast a circle or even if it was necessary at all. After having created a sacred space, however, I understood that just being in that wonderful space was a valuable experience in itself. Not only are unwanted energies kept out of the space but some really amazingly beneficial energies are invited in. Not only are you protected, but the energies, entities, gods/goddesses and spirits that show up for the party are ready to join right in with whatever you have planned! As soon as I start tracing the circle and saying the chant, I start to feel the excitement well up inside of me. When I declare, “The circle is cast!” I feel the wall of energy rise up to surround me and my companions. As I call the quarters, I feel the guardians and elemental spirits file in through the portals as we light the quarter candles. When it is time to release the circle and I have declared, “the cirlce is released!”, I feel an immeditate falling of the wall of energy that had surrounded us, and all seems very still. Last night in our circle my friend and I just felt like giving thanks and praise to the Lord and Lady and thanking Spirit for all we had. We also rededicated ourselves and our healing practices to Brigid. At that point we both felt a very peaceful presence standing behind us. There are various ways to cast a circle, some more formal than others. I decided to write my own words and procedures based on others that I had read about. The ceremony reflects who I am since I think your rituals and ceremonies should reflect you as an individual. Respect should be shown and a certain amount of decorum should be followed, but the circle of this little hedgewitch does not need to reflect the intricate protocol of the ceremonial magicians. Below is a standard procedure for casting a circle. It is not the one I follow and the words are not my own. If you don’t regularly create sacred space I suggest you give it a try. Take the following procedure and decide what you wish to include in your circle casting ceremony. May you find peace, inspiration and wonder in your sacred space! Start by determining how big your space needs to be. A ceremonial circle is a place in which positive energy and power are kept in, and negative energy kept out. The size of your circle will depend on how many people need to be inside it, and what the circle’s purpose is. If you’re hosting a small coven meeting for a few people, a nine-foot-diameter circle is sufficient. On the other hand, if it’s Beltane and you’ve got four dozen Pagans preparing to do a Spiral Dance, you’ll need a space significantly larger. A solitary practitioner can work easily in a three- to five-foot circle. Figure out where your Circle should be cast. In some traditions, a Circle is physically marked on the ground, while in others it is merely visualized by each member of the group. If you have an indoor ritual space, you can mark the Circle on the carpet. Do whichever your tradition calls for. Once the Circle is designated, it is usually navigated by the High Priest or High Priestess, holding an athame, a candle, or a censer. Which direction will your circle face? The circle is almost always oriented to the four cardinal points, with a candle or other marker placed at the north, east, south and west and the altar in the center with all the necessary tools for the ritual. Before entering the circle, participants are purified as well. Mark the circle upon the floor or the ground. Place a candle in each of the four quarters – green to the North to represent Earth, yellow in the East to represent Air, red or orange symbolizing Fire in the South, and blue to the West in association with Water. All necessary magical tools should already be in place upon the altar in the center. Let’s assume that the group, called Three Circles Coven, is led by a High Priestess. The HPs enters the circle from the east and announces, “Let it be known that the circle is about to be cast. All who enter the Circle may do so in perfect love and perfect trust.” Other members of the group may wait outside the circle until the casting is complete. The HPs moves clockwise around the circle, carrying a lit candle (if it’s more practical, use a lighter instead). At each of the four cardinal points, she calls upon the Deities of her tradition (some may refer to these as Watchtowers, or Guardians). to watch over the rites of Three Circles Coven. do so in perfect love and perfect trust. How do you enter the circle? In perfect love and perfect trust or In the light and love of the Goddess or whatever response is appropriate to your tradition. Once all members are present within the circle, the circle is closed. At no time during ritual should anyone exit the circle without performing a ceremonial “cutting.” To do this, hold your athame in your hand and make a cutting motion across the line of the circle, first to your right and then to your left. You are essentially creating a “door” in the circle, which you may now walk through. When you return to the circle, enter it in the same place you exited, and “close” the doorway by reconnecting the line of the circle with the athame. 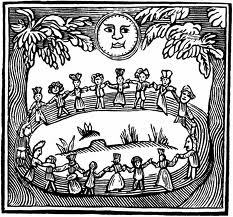 When the ceremony or rite has ended, the circle is usually cleared in the same manner in which it was cast, only in this case the HPs will dismiss the deities or Guardians and thank them for watching over the coven. In some traditions, the temple is cleared simply by having all members raise their athames in salute, thanking the God or Goddess, and kissing the blades of the athame. If the above method of casting a circle seems boring or dull to you, that’s okay. It’s a basic framework for ritual, and you can make yours as elaborate as you like. If you’re a very poetic person who likes lots of ceremony, feel free to use creative license – call upon “the weavers of the wind, the breezes that blow from the East, blessing us with wisdom and knowledge, so mote it be,” etc, etc. If your tradition associates various deities with the directions, call upon those Gods or Goddesses in the ways that they expect you to do so. Just make sure that you don’t spend so much time casting the Circle that you don’t have any time left for the rest of your ceremony! Have all your tools ready ahead of time — this will save you from scrambling around during the middle of the ritual looking for things! If you forget what you mean to say when casting the circle, improvise. Talking to your deities should come from the heart. If you make a mistake, don’t sweat it. The universe has a pretty good sense of humor, and we mortals are fallible.